You have to admit. Most women tend to accumulate a lot of beauty products. That’s because being a woman whose kept together requires a lot of stuff. There’s the facial products that keep your skin healthy, the perfumes that keep you smelling nice, the makeup that enhances your beauty and the powders that….well, keep the lady parts dry and smelling fresh. When you have a lot of beauty products, it can be daunting to keep up with it all. But, let’s face it ladies. Getting rid of our stuff is NOT an option. Have an organizer in place. Before you can even begin to keep your beauty products organized, you need a place to store them. I picked up the perfect item for under $10 and it keeps most of my makeup organized at all times. Group like items. A fool proof way to keep your stuff organized is to group like items with each other. When you’re done with them, it becomes habit to put them back in their place. Store lipsticks, glosses, and balms together. Store eye shadows, liners, and mascaras together. Organize all your brushes in one place. Keep your skin care products (cleansers, toners, moisturizers) grouped in the place where you’ll use them most often. Keep your perfumes organized on your dresser or cabinet by type of scent (musks, florals, fruity scents etc.). Take time once a month to dump expired beauty products. This will help keep your products organized because you won’t have to hunt through the junk to get to what you ‘re looking for. This also makes revamping your beauty bag in the fall much easier. Have 2-3 beauty bags on hand. If you are a lady who likes to travel with your beauty essentials, you can keep a bag pre-stocked with your regularly used items: foundation, powder, liners, mascara, lip gloss, brushes, cotton pads, hair accessories and a small bottle of perfume. When the time comes, you can grab it and go. All you’ll need to add is the items that you don’t regularly use – like colored lipsticks or eye shadow. Group makeup by color. As an alternative to grouping your cosmetics by type, you can group them by color. In this case, you’d keep your eye shadows, lipsticks, blushes, liners grouped together by color (reds with reds, purples with purples, etc.). I find this to be less organized (unless it’s nail polish) but different things work for different people. Having your makeup grouped by color may be your thing. No longer do you have to search frantically for your favorite cosmetics and beauty products. I’ve found that these shortcuts I’ve shared are very helpful. 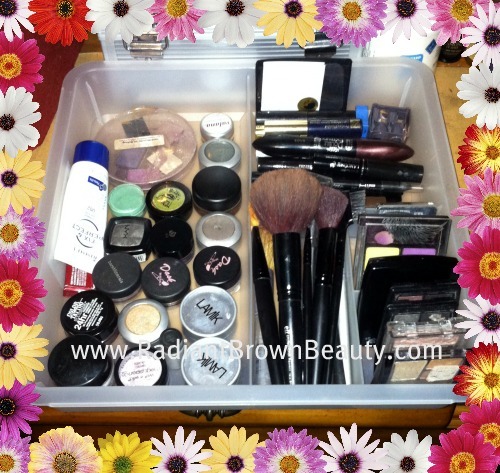 How do you organize all of your beauty stuff? You must have been inside my bathroom when you wrote this post! My beauty products are in such a disarray! I have one of those three drawer plastic carts in my bathroom (because it my cabinets don’t have any drawers) but I just end up throwing everything in there. This is was great to read, giving me incentive to clean my stuff up! 🙂 MJ I used to have one of those drawers too and you know what? I did the same thing! Rarely did I keep it organized. Less is more. That’s so true. In the next few weeks though I’m going to go through a process of clearing clutter and minimalizing of sorts. That will mean that I need to throw away and give away a ton of stuff but I must! I love this post, Michelle! #4 is definitely a lifesaver. I have mini-travel bags of makeup always ready to go. One is for daytime looks and the other is for night time looks. It saves sooooo much time! I love looking around Ross Dress for Less for different little multipurpose organizers. You would be surprised at how many cheap organizational ideas you can find from there! uh oh you just turned me on to something new. Ross Dress for Less? Is it an online store?? I’m about to check and seeeeee! Great ideas, I use plastic, multidrawer organizers under my sink to keep everything in it’s place. Also, I found a desk organizer from Goodwill for $1.97 which I use for my brushes. That’s what I’m talking about. Nice cheap organizers! It’s funny how many things you can find that have a multipurpose to them. Thanks Alison. I can get a little messy with my stuff at times so I love little things like this. By the way, you should get your order by tomorrow or Fri. Thanks for the support! I love your organizer! Why hadn’t I ever thought to use something like that for my make up? Thanks Jen. I love finding small stuff for low prices that do a big job!